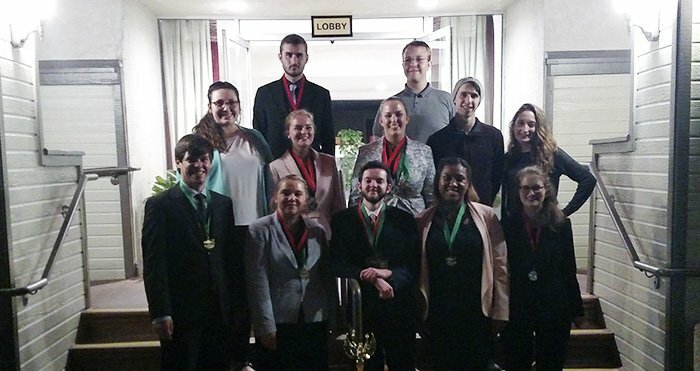 Grand Canyon University’s Speech and Debate team earned second place overall last weekend in the Sunset Cliff Classic at Point Loma Nazarene University in San Diego. This marks the third consecutive top-three placement for the GCU team. Led by new coach Michael Dvorak, the team’s ranking at the competition put it ahead of Biola University, Northern Arizona University and the University of Southern California. Two GCU debaters, sophomore Matthew Calderwood and senior Taylor Alandzes, earned a top-eight position in the varsity division. Alandzes was ranked ninth among the best individual debate speakers in the tournament. In addition, freshman Ben Struebel was ranked as the sixth-best speaker in the junior varsity division. On the speech side, junior Thomas Gleason won first place in extemporaneous speaking, which earned him a second place in combined events, and junior Keliann Nash took first place in prose interpretation, earning her fifth place in combined events. The combined success of the speech and debate team has allowed GCU to expand its national presence, and the team hopes to continue its recent success through its national championship season, which begins at the end of this month, said Dvorak. The Christian College National Championships are scheduled for March at Azusa Pacific University.